The story of Amy’s Bakery Zucchini, Carrot and Apple Muffins: Zucchini. Have you had any show up on your front porch lately? A couple of weeks ago, I walked into my kitchen and found three zucchini on my counter. No idea how they got there. Pretty sure I didn’t grow them in my batting cage… When my kids came home, I asked them about the mystery z.
Jake said Chris, my back-door neighbor handed them over the fence (thanks Chris). Probably when he was out back, hitting plums from the deck into the batting cage. They sat on the counter for a few days, and eventually ended up in muffins.I chose this recipe because I had two ENORMOUS bags of carrots in my fridge. In a moment of stupidity, I bought this warehouse-great-deal bag of carrots. Enough carrots to feed a small country. I think it weighs twenty pounds. I was making a carrot cake at the time and thought it was a good idea. So a month later, I still have 19 pounds of carrots in my fridge. Well, after this recipe maybe 18. Let me know if you need any carrots. Oh, the muffins. Wonderful. I love Amys Bread in NYC. If you love carrot cake, you’ll love these. They are dense, not too much sugar and are made with veggie oil instead of butter. I added raisins to the batter, since I love raisins in my muffins. Great texture. A meal in a muffin! Position rack in middle of oven. In large mixing bowl, add flour, sugar, coconut, cinnamon, baking soda, salt and baking powder, whisk together. In another medium size bowl, whisk eggs, oil, and vanilla. Add grated carrots, zucchini and apples. Stir together, until all fruit and vegetables are mixed well. Pour liquid ingredients into dry ingredients all at once. Fold in nuts and raisins if using. The batter will be very thick. Scoop the batter into greased muffin pan using a large cookie scoop. Or use a large spoon or measuring cup. Fill the muffin tins almost to the top to insure full, rounded muffin tops. Bake at 400 for ten minutes, lower oven temperature to 350 degrees and bake for an additional 6 minutes. Check the muffins by inserting a toothpick in center, if it comes out clean, muffin is done. Leave the muffin in the tin for about ten minutes, then loosen edges with a butter knife and remove from pan to cool. Tips:-I used unpeeled, cored Macintosh apples.-I did not add the nuts, but added golden raisins. You may add one or both.-The original recipe calls for 12 large muffins. I thought the muffins would be too big as a large muffin, especially since these are dense, filling muffins. I baked the muffins in regular size muffin tins. The recipe yielded about 22 regular size muffins.-Since I did not make the muffins into 12 large muffins, I cut the baking time. The original recipe calls for 400 degrees- ten minutes, rotate the pan, lower temperature to 350, then bake for an additional 22-25 minutes. Maybe this was a misprint in the original recipe? That would total at least 32 minutes. Way too long. My muffins were done baking in 16 minutes flat.-Super moist. Great texture. The muffins freeze well. I'm loving these muffins! The pictures are awesome, I can practically see the spice! 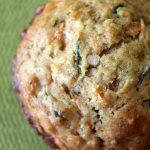 Great breakfast muffin for on the go morning madness! These muffins were great! I omitted the coconut since my daughter doesn't care for it (& I didn't have any!). I also did regular size muffins (made 24) & baked at 350 for 15 mins. They're perfect! Thanks so much for the recipe. We loved these muffins!!! I substituted whole wheat flour 3/4 cup to every 1 cup all purpose called for in the recipe also added 1 T chai seeds and loved your recommendation to add raisins. I also omitted the coconut. Fantastic muffins! Thank you for a delicious recipe my whole family can enjoy! I'll feature them on my food blog at some point in the future! Just made these!!! SOOOOO good!!! and my little veggie hater gobbled two of them up so that made me a very happy mamma! Do you squeeze the liquid out of the zucchini after grating it? Another of my recipies asks you to do that and I didn't know if it was needed for this one also. Thank you! no need to squeeze the liquid out! Sorry, I just restored the recipe, it was lost in the conversion from Blogger to WordPress last month! Where’s the recipe? I don’t see it. See comment above, it’s back up now! I cannot see a link to the recipe! Where is it?? See comment above its back up now! I got worried the 2 teaspoons of baking soda was an error? I haven’t ever made muffins with that much soda so I ended up doing 2 tsp baking powder and 1 tsp soda. The muffins rose well and were delicious- my family loved them. Is it really 2 tsp soda and only 3/4 tsp of powder? I wasn’t sure what would’ve been so acidic in the batter to react with all of that soda. I’m glad your variation turned out well, Asha. And yes, I use 2 teaspoons of baking soda for this recipe. Thanks for asking and for reading ABK!